Houzz 34 of our visitors have told a friend about this plan. Question: Are the ceilings vaulted in the great room? Or are they taller than the ceilings in the rest of the house? Same question for the kitchen. Thank you! This house is gorgeous! Answer: The ceilings are 10’ throughout the house. The great room can be vaulted or raised higher if preferred. The kitchen can as well. Question: Is there a slightly larger version of this plan? Answer: Unfortunately, we don't have a larger version of this plan. Question: Is this available in a 3 bedroom plan? 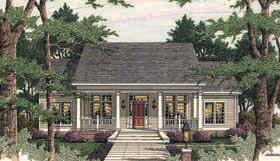 Answer: Yes, take a look at the 3 bedroom version Plan Number: 40015. Answer: The ceiling heights are 10' in Plan 9816. 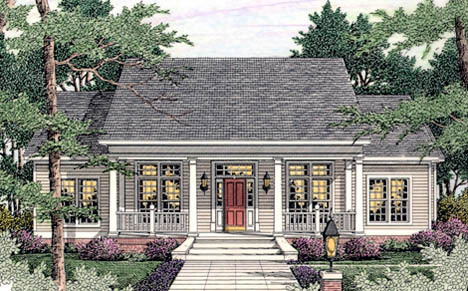 A set of plans includes a cover sheet, all exterior elevations, floor plan (s), your choice of slab, crawlspace or basement foundation plan (on most designs), any necessary cross sections and details, schedules, fireplace details, electrical plan (s), roof plan, and interior elevations. Due to regional variations, local availability of materials, local codes, methods of installation, and individual preferences, only the location of fixtures are shown. The duct work, venting and other details will vary depending on the type of heating and cooling system and the type of energy that you use. The details and specifications are easily obtained from your local builder, contractor, and/or suppliers.